Do you have a earwigs, aka pincher bugs? Earwigs are mostly an outdoor pest that occasionally makes its way indoors, making it an occasional invader. Contrary to popular urban legend, earwigs received their name from the superstition that they crawl into ears and tunnel into a person’s brains while they are asleep. Earwigs have a slender and elongated body and are dark brown to black in color with two antennae. Earwigs, sometimes referred to as “pincher bugs”, have two pinch-like cerci that can be used as weapons and help to catch prey. Adults may or may not have wings. Earwigs are active at night and remain hidden during daytime. Earwigs prefer moist environments and are often found hiding in cracks, crevices and beneath rocks and debris piles.Earwigs feed on a combination of plant and animal material, including leaves, flowers, fruit and other insects such as aphids. Earwigs often invade structures during periods of weather change or to seek food sources. Earwigs congregate in large numbers because of a pheromone that is emitted by the species. AmeriGuard Pest Defense provides earwig control services. Your service technician will perform a thorough visual inspection to identify the severity of your earwig problem. During the inspection, all sources of the infestation will be identified and methods of earwig treatment will be discussed. The technician will also point out potential cricket harborages and suggest mechanical methods of earwig control where available. A successful earwig control service depends on the cooperation of our customers. 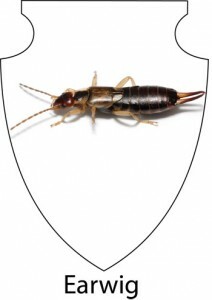 One-Time, Monthly and Bi-Monthly Earwig Control Services are available. A General Pest Control Maintenance Plan will include control for earwigs on an ongoing basis, along with all other general pests in the Southern California landscape. What Can You Do to Get Rid of Earwigs? Earwig control can be further improved with the assistance of our customers. Below are a few tips a homeowner can perform to reduce the likelihood of an earwig infestation. Modify Landscape – popular landscape elements may be contributing to an earwig problem. Reduce abundance of stones, ornamental rocks and mulches. Remove harborages such as bricks and wood piles. Eliminate low-lying vegetation near structures. Keep shrubs and brushes trimmed back from walls and roofs. Clear rain gutters of debris. Moisture Control – Ensure proper drainage and direction of sprinkler systems. Eliminate moisture from subareas. Contact your earwig service experts at AmeriGuard Pest Defense for an earwig treatment quote. Most quotes for earwig services can be provided over the phone without any obligation. AmeriGuard Pest Defense’s Earwig Maintenance Program will help eliminate current earwigs as well as help prevent future earwig infestations. No contracts required! Both the inside and outside of your home are always under warranty with a Maintenance Program. AmeriGuard’s Pest Defense Program guarantees your satisfaction between regular scheduled maintenance with unlimited free re-services. If at any time you find yourself in need of an additional treatment between regular scheduled services, call us and we will return to re-treat your home absolutely free! One-Time, Monthly and Bi-Monthly pest control services are available.